There is a scroll design written on the facsimile of Bach’s autograph of “Well-Tempered clavier”. 1999,Andreas Sparschu(Mathematician) released that these scrolls represents a tuning system. Immediately after this theory,various interpretation have been released by many specialist. Among these interpretation,after 2005 Bradley Leaman’s study,Emile Jobin released an original interpretation. I found out this interpretation from web site of YukoWATAYA,organist in Belgium. She translated Emill Jobin’s Interpretation of Bach’s tuning system. It aroused my interest very much and through this data .I drew this graph. In this tuning system,C-e and G-b is pure 3rd. Also the presence of wide 5th is another characteristic. The strict sound of pure 3rd is indispensable in the sound of organ. This derives from the church music symbolizing the prayer. If there are 2 pure 3rd,inevitably there exists wide 5th. This is a trace of organ tuning system. Bach was also an organist. It is very natural to think. in order to play in every key. As a piano tuner, at the beginning,I thought it is unnatural to use wide 5th. But gradually,I felt that this may sound quite attractive. I realized that this has similar nuance as tuning in slightly wide octave. In order to make C-e and G-b pure 3rd,5th of C-G-D-A-E are 5th of meantone[696.5 cents]. Triple scrolls are colored gray. Single scrolls are colored white. 3 remainder 5th are slightly wide 5th.Double scrolls are colored pink. There are letter C, single scroll and a number 3 at the right side. Single scroll beside this number is interpreted as major 3rd from C.
This must be pure 3rd. Pure 3rd is colored yellow. This tuning system is made of pure 3rd and also 3rd that has even more howling as that of Pythagorean. This makes a strong contrast in every keys. It might sound unnatural on Piano if you don’t understand this system. Apparently,this is not to draw a conclusion of Bach’s tuning system. 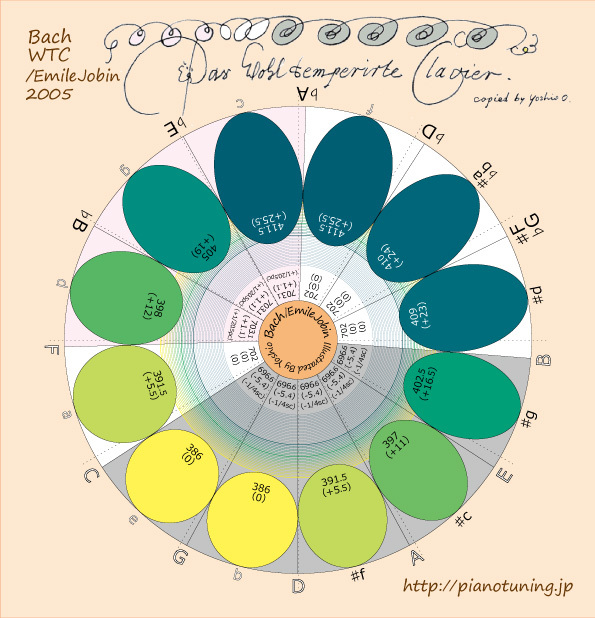 More than 30 years have passed from jumping conclusion of playing “Das Wohltemperierte Clavier” by equal temperament. I think this way:May be Bach recommended “Don’t use mean-tone that is not good enough. Play this clavier with well-tempered”. Special thanks to Ms. Midori Kita.